What’s the big deal, anyway? Call it Ayers Rock or Uluru, Kevin thinks the big, red rock at the centre of Australia is nothing more than a glorified tourist trap. Having just experienced the magic for himself, John sets out to change his mind. Listen in and experience for yourself an Uluru sunrise with bikini-clad resort babes jaded smokers and yoga instructors, and ponder the improprieties of the satellite photography in Google Earth. I ask you: is this not paradise on earth? For the low-budget tour, install Google Earth and open this placemark. 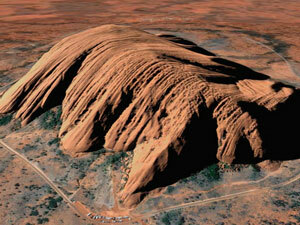 As mentioned in the show this is an image of Mulga Man, which is one of Uluru’s many weathered features. You are currently browsing the Lost Out Back weblog archives for the month October, 2006.